If you happen to be in Milwaukee, WI a few of my printmaking works including Synthesis No. 2030 will be on display and performed at this interdisciplinary exhibition! 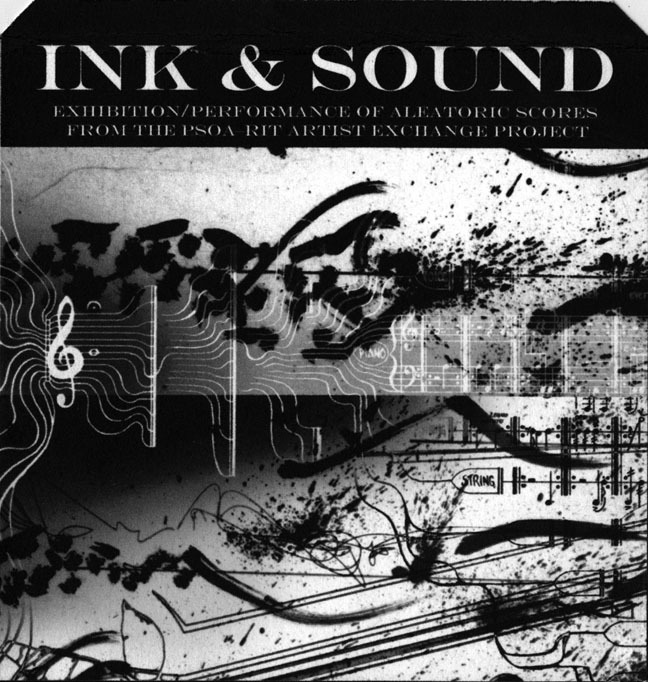 Ink & Sound Directed/Curated by Amanda Schoofs (PSoA) and Paul Mitchell (RIT) Exhibition at 7:30 Performance at 8:00 Ink & Sound is an interdisciplinary project between the Peck School of the Arts at the University of Wisconsin-Milwaukee, and the at Rochester Institute of Technology’s College of Imaging Arts and Sciences, Fine Arts Printmaking Program. 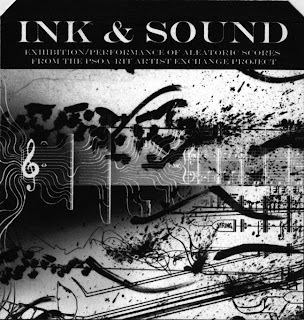 Ink & Sound builds upon composition and printmaking’s historic and conceptual connections. The printing of musical notation has resulted in a parallel evolution in modes of dissemination of information both musically and visually. This project goes beyond the reproduction of musical information to mirror the process of translation, interpretation and collaboration, inherent in both art forms. This cross-disciplinary exchange has revealed these connections while brining together the ideas and knowledge of young artists and composers. 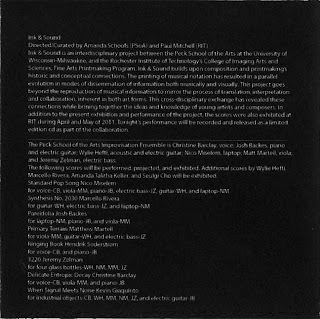 In addition to the present exhibition and performance of the project, the scores were also exhibited at RIT during April and May of 2011. The performance will be recorded and released as a limited edition cd as part of the collaboration. 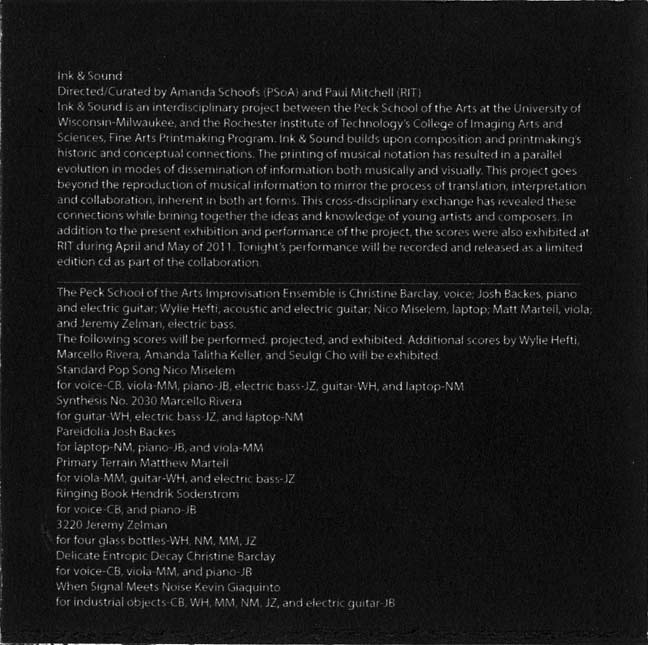 The Peck School of the Arts Improvisation Ensemble is Christine Barclay, voice; Josh Backes, piano and electric guitar; Wylie Hefti, acoustic and electric guitar; Nico Miselem, laptop; Matt Martell, viola; and Jeremy Zelman, electric bass. The following scores will be performed, projected, and exhibited. Additional scores by Wylie Hefti, Marchelo Vera, Amanda Talitha Keller, and Seulgi Cho will be exhibited.